What Happened With Raj Nair's Departure From Ford? Ford’s North American president Raj Nair was ousted last week for unspecified “inappropriate behavior,” yet no one at Ford or elsewhere has named any specifics on the record as to what that was. 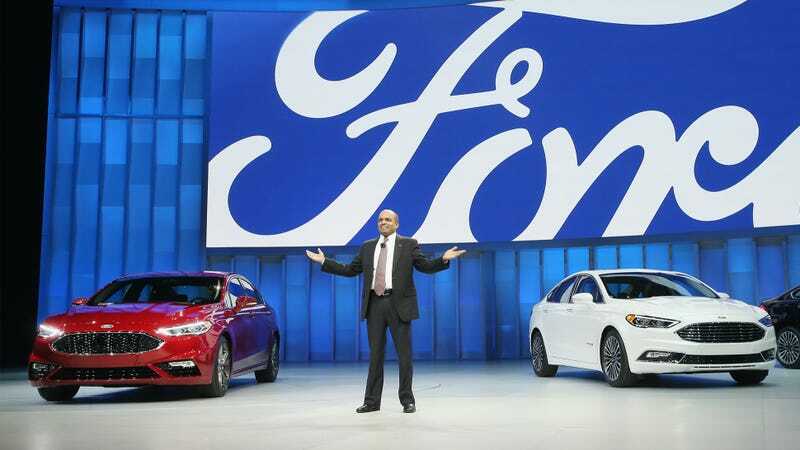 It was a major unplanned departure for one of Ford’s most senior people, and something that stunned the whole auto industry. So, what happened? Nair’s ouster was prompted by an anonymous complaint which was then investigated by the company, and as a result, he admitted to an unspecified wrongdoing. A Ford representative contacted by Jalopnik would not divulge any particulars about what kind of inappropriate behavior led to Nair’s dismissal. I sincerely regret that there have been instances where I have not exhibited leadership behaviors consistent with the principles that the Company and I have always espoused. I continue to have the utmost faith in the people of Ford Motor Company and wish them continued success in the future. This suggests—although we can’t confirm it at this time with Ford—that whatever happened may also involve someone who worked for Nair in some capacity. Ford has declined to comment further. We also know that the behavior was reported anonymously through a 24-hour company hotline, according to a Ford spokesman who spoke with Automotive News. Hotlines for work-related issues are a common feature at many large companies, and are one way to report problems anonymously, with less fear of retribution. This call sparked an investigation into incidents involving Nair, and the results of that investigation led to Nair’s removal. The timing of Nair’s dismissal comes amid a host of resignations or firings across multiple industries due to revelations of sexual misconduct. Ford has been no exception. A New York Times investigation in December into the frequent sexual harassment at Ford’s Chicago plants prompted Ford CEO Jim Hackett to send a letter telling employees, “There is absolutely no room for harassment at Ford” and that there would be “zero tolerance” for like incidents in the future. At the same time, I hestitate to bring up Nair’s firing in the same conversation because there’s so little that we do know about it. We don’t know who was affected, what the nature of the incidents involving Nair were, or if the person who brought it to Ford’s attention was even female or part of any other class of workers who is more frequently subject to unwelcome behavior. So far, no one will clarify it, either. After all, sexual misconduct isn’t the only kind of misbehavior that can lead to a powerful man’s ouster. One of the most popular automotive TV personalities on the planet was fired for punching a crewmember in the face about a dinner he didn’t like. And lest we forget the giant game of musical chairs that has gone down at Volkswagen in light of the Dieselgate scandal. The vague term “inappropriate behavior” could be almost anything. This is why we’re seeking clarification: Has the #MeToo movement finally hit the automotive industry’s highest levels, or did something else happen behind the scenes at Ford? If you have any more details about Nair’s ouster that you’d like to clarify for us, our line is always open: tips@jalopnik.com. You can also find how to contact us confidentially through SecureDrop here.